Amy Winehouse could be in trouble again after an alleged scuffle at a theater on Saturday. (PEOPLE.com) -- Amy Winehouse could be facing another police investigation for assault. The British singer allegedly attacked a theater staffer at a holiday pantomime show in Buckinghamshire, England, on Saturday night, according to a report in the Sun newspaper. The British newspaper says Winehouse, 26, became boisterous and shouted obscenities at the cast of a production of Cinderella, which included Hollywood actor Mickey Rourke. Staff tried to usher her into a private box, but the singer allegedly kicked and punched front-of-house manager Richard Pound before being dragged out by her own security staff. 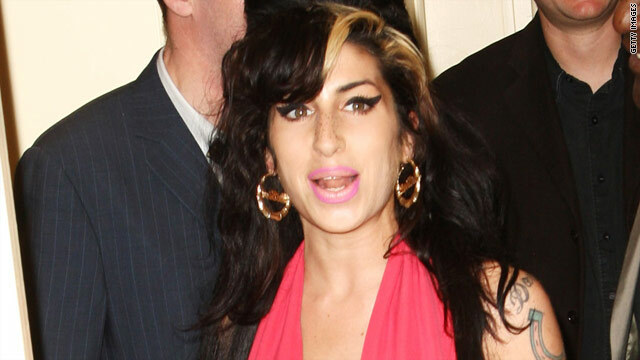 A Winehouse pal told PEOPLE: "Amy was invited by a friend of hers starring in the show," adding that no charges were brought against her. "She wasn't arrested, and she hasn't been questioned by the police yet." In a statement, Thames Valley Police confirmed that an incident occurred. "At around 9:05 p.m. on Saturday night officers were called to the Milton Keynes Theatre in Marlborough Gate, following reports that a 27-year-old man had been assaulted. No arrests have been made and the incident is being investigated." Winehouse, who is currently working on her third album, was cleared of assault earlier this year after being accused of hitting a fan at a charity event in 2008.